Traditional style stationary upholstery in the Cooper collection gives you fabulous pieces to update a large living space in your home. 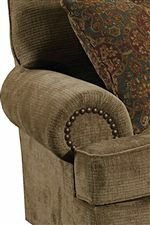 Deep seating, tall backs and a large scale profile make these pieces an easy way to update your living room. 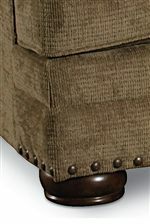 Details include nailhead trim along the arms and front as well as finished wood bun feet. Toss pillows and fabric options let you create the look that you want and need in your home. Browse other items in the Cooper collection from AHFA in the area.